Consolidated place to highlight my slow build of an 06 Sportsman 800 EFI. As I picked it up, early winter. Added LED bulbs to the rear to start, found one full of water after cleaning up a bit, so I replaced it with an eBay find. You can see the difference between the Sylvania and JSTAR LEDs and the OEM halogens. Cleaned up with 303. Love that stuff. You can see the 4GA wiring added for rear winch/battery jump in the hitch area. 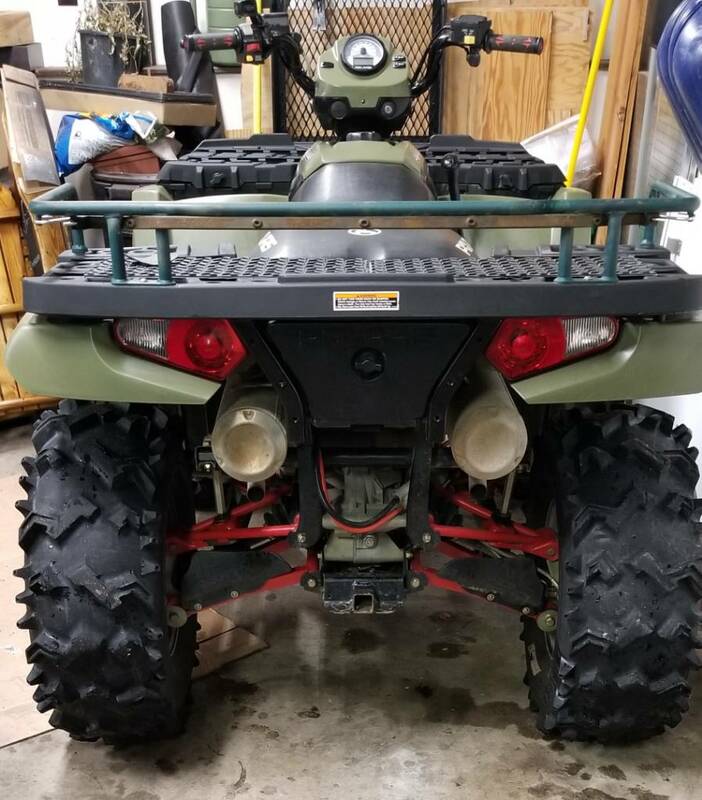 Added a QuadBoss 2" hitch for winch, trailer, and cargo rack type accessories. Last edited by Thunderbear; 02-14-2019 at 11:56 AM. More on the rear winch: Terra 4500 Superwinch, with Masterpull 10,000lb 1/4" line, on a Curt 31010 winch plate. Custom solenoid and remote housing. 4GA copper jumper cables cut for Superwinch QD connectors, and ring terminal crimped and heatshrunk on the battery side. Repaired the seat holes with some GearAid nylon repair packs. 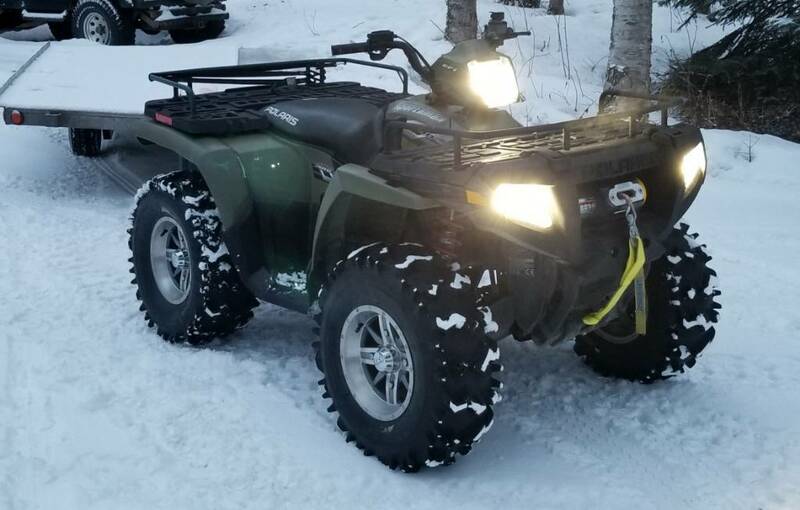 Planning on a Polaris seat heater to cover it altogether at some point. De-safety-stickered awhile back. Also visible are the Polaris thumb and grip heater switches, the install of which I apparently forgot pictures. Owning an older rig is a real good way to improve your Google-fu to find long discontinued OEM accessories like a front rack extension. Since charging is always a challenge, in order to lower current draw and increase light output, I ordered a set of three 880 Morimoto 2Stroke 2.0s. Outside of Diode Dynamics SL1s, the Morimotos are one of the best LED headlights available, and are a much warmer color temp. The bases of the LED bulbs are slightly rounder than the sockets on the Polaris, but a very slight trim (less than half a millimeter) and they fit perfectly. The fan is a challenge in the pod, so route your wires carefully in the pod, and I decided to use the Hella micro relays for more space. While in there, discovered a wire on the high beam circuit was broken, so I added the three headlight relay mod while fixing it. Highly recommend the heat shrink terminal bulk packs on Amazon. Which brings us somewhat current, to today. I doubt know if they didn't come with them or my front box is a replacement, but I wanted a retaining strap for flipping up a loaded front box. So rather than pay Polaris $20 for one, I built mine with stainless and plastic coated wire, stainless thimble, stainless eyelet and aluminum crimps. Used the stainless bolt and a washer for the rack extension as the upper attach point. Drilled out and tapped the lower holes which appear to be for this purpose. Hmm, I wonder why I kept getting the overheat warning? Baked silt on the rad, plus steam leak means replacing with GPI Racing aluminum radiator and new 5410584 Polaris bushings for the lower mount. Added the double tube bumper I bought a while back. Still painting the Rigid light mounts to go on. Sandwiched the plastic splash guards with the mounts because I didn't want to give up the protection. I’m going to do that front cover stop to mine... Thanks! Last edited by FPD218; 03-04-2019 at 12:55 PM. Nice work, you've really breathed some life back into that thing. You been able to get out and have some fun on it yet? Nice upgrades for that old 800. How's your seat bottom and exhaust heat shields look? That's a problem area with that machine.